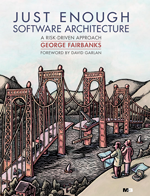 Course participants will leave with a coherent mental framework of software architecture, helping them to reconcile business needs with implementation issues, identify risks, and successfully design systems. We offer a set of interlocking classes designed to suit your needs. The shorter the course, the more general the intended audience. Combining the two 3-day architecture courses yields the same content as the 5-day marathon course. Splitting the training is recommended so that participants have an opportunity to try out the new techniques (and generate questions) before the advanced material. The lectures in the 3- and 5-day courses contain a running example and comprise about 60% of course time. The remaining 40% are in-depth exercises designed to reinforce key concepts. Here’s a review of a class in Houston.